It’s been so long since I’ve written but believe me, I’ve thought of you all so often and have so many things I want to share with you during the coming months. I needed to check out for a while so I could be with my family as we navigated the dark and murky waters of my father’s unexpected blood cancer diagnosis. As you may remember, we moved to Granite Bay almost a year ago to be closer to my parents. Shortly after we moved into our new home, however, my dad began to feel unusually tired. Even though he was perfectly healthy up to that point, he knew something was wrong. And it was. After trying just about everything, including chemo, it became clear his illness was terminal. My father passed away four months ago with my mother, my brother, and me by his side. My mother and I spent every hour with him for the two weeks he was in the hospital, with her taking the night shift and me taking the day shift. To be able to have that time with him – to hold his hand, stroke his head, rub his feet, or to sit in silence as his life was ending was a heartbreaking yet precious gift. Many of you know my mother, if not personally then through my blog (here and here), so I’ll try and answer a few questions you may have: 1) she’s the strongest person I’ve ever known and is doing as well as can be expected, 2) she’ll most likely sell her home next spring (this was in the works before my father became ill) and move nearby to a smaller home with a smaller garden, and 3) I’m spending a lot of time with her and we’re both getting through this, finding comfort in each other’s company. As I’ve been spending so much time in my mother’s garden, I’ve seen so many subtle transitions from week to week, sometimes day to day, and it’s been incredible. I thought I knew her garden inside and out, but every day I seem to discover something new. And every day I find immense solace in seeing so many of my father’s touches in the garden, everywhere I look. I’m looking forward to sharing their garden with you in the coming weeks (as well as lots of other gardens I’ve visited) but for now, I just wanted to thank you for hanging in there with me during this awful time, and for the kind notes many of you have sent. Your support, as usual, means the world to me. It sounds like you inherited your mother’s strength. Blessings. Thank you, Shelley – I certainly hope so! I’m so very sorry for your loss. Please accept my heartfelt condolences. I missed your voice but am glad to know you were able to have this quality time with your father and mother. Warm wishes. Thank you, Erika, I appreciate your thoughtful comment. I admire Helen Keller so much, Nancy – thank you for the beautiful quote. It’s so true, isn’t it? We’re so sorry to hear you lost your dad. Take comfort in happy memories. 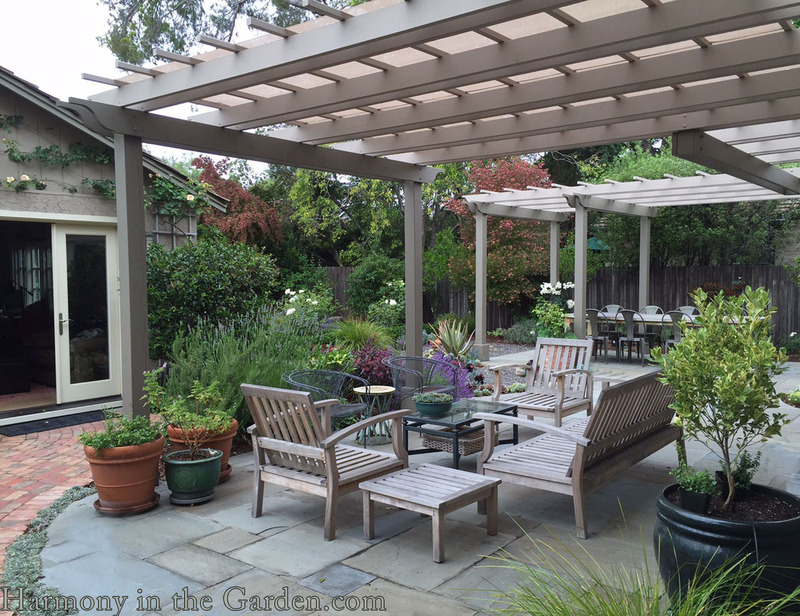 We think of you often when we’re enjoying our garden and miss having you here in Los Altos. How nice to hear from you, Jeanne, thank you. And I’m so happy you’re enjoying your garden – I bet its more beautiful than ever! Oh, Rebecca, you’ve said so well what you felt during your father’s illness. I felt like that during both of my husbands’ last days. It was terribly sad but so intimate a time. I’m glad you had those hours with him and were able to support your mother. Welcome back to us – we missed you. Oh, Maia, I can only imagine what you went through with your husband’s illness. It’s an incredibly intimate and special time, as heartbreaking as it is, isn’t it? I think its the ultimate blessing, to be there with someone you love and hold their hand as they go through this phase of their life. Rebecca, I have always loved your posts, had missed them, and was wondering how you were doing in your new area. I know you moved to be near your parents, but could not have imagined what this first year would bring for you. I am so sad for you to lose your wonderful dad, but know that being right there to help in every way was a gift for you and your parents. I am thinking of you and send hugs. What a sweet thing to say, Marilee, thank you so much. The timing of my move was certainly divinely inspired and you’re so right in that it was the most precious gift of all to be able to help. I am so sorry for your loss. The time really WAS right for the move. It’s so interesting when we look back and see that what were very clear reasons at the time were only part of the bigger picture that emerges after we have acted on those strong inner urges. My grandparent’s house released me so I could move to Alabama to help with my elderly mother, who died two years later. The bigger picture was that my brother-in-law died four years after my mother. Had I not moved, my sister would have been all alone in what was an extremely difficult time. I’m so glad you were there for your parents and that you can help your mother adjust to her new life. I’m glad you are back, Rebecca. I’ve missed you. Thank you so much, Erika, and I’m sorry for your loss as well. Oh Rebecca, I’m so sorry to hear about your dad. In hindsight, what a wonderful decision you and your husband made to move closer to your family so you could be there throughout this time. Please know that you and your family are in our hearts during this rough time. I was touched by the fact that you made your family a priority. Being there present for your loved during the transition process is the ultimate gift of love. You’re so right, ZT, being present was the most important thing I’ve ever done in my life and I feel like it was a gift not only for my father, but to me. Thank you. So sorry for hear of your family’s loss. How wonderful that you were able to spend time ttogether supporting eaxh other during your Dad’s illness. We’ll look forward to hearing about the garden he and your mom tended and the inspeiation they provided for you. Thank you, Sue, I appreciate your comment. And thank you for hanging in there during my absence! So good to hear from you. Our love is with you everyday as you navigate this journey with your family members. If there is anything we can do please let us know. I’m so sorry to hear this news. Your father was so fortunate to have so much love throughout his life. I am hopeful that his love will in turn carry you and your mother forward as you grieve and ease your journey a little bit. He will be close by in your hearts forever. You’re so right, Ronnie, in that his love helps us get through this. He was a lovely, lovely human being and the best father I could’ve ever wanted. Thank you for your thoughtful comment. Warm hugs coming your way . You have been nestled in my mind for the last months and I didn’t want to be intrusive or ask why. Thank you, Sheila – I just needed to disappear for awhile to process everything and appreciate your encouraging and kind words. Thank you, Marilou. I look forward to writing again! Welcome back….looking forward to more posting…take care all the best!! I’m so sorryy for the loss of your dad. What a wonderful family.. you are inspiring in the way you handled this difficult time… God bless you as you and your mom adjst to yournew life circumstances.. Thank you, Donna, I appreciate your sweet comment. We’re slowly adjusting even though we’ve been in a fog most of the time. The sun does eventually come back out, though, and I think we’re on solid ground once again, able to being moving forward. It is great to hear your voice. Welcome back. Thanks for sharing. How blessed you are to have your Mom and Dad’s garden to spend some time in during your journey of grief. And the garden memories will be with you the rest of your life. I often think of my Dad bringing in that one beautiful rose from the garden for my Mom. Love is all around when you have the gift of gardeners in your life. Good to see you at the Shrub talk. Rebecca, I am sad to hear about your Father’s passing. What a blessing that you and your Mother are so close, both emotionally and geographically. I find myself wondering what is next for you and wish you all the best as you mourn your grief away and come back to life in good time. A very sad time, but what a blessing for you all to be together. Thank you, Linda. It’s truly a blessing in so many ways. So sorry for your family’s loss Rebecca. You and your family will be in my prays. It is such a blessing to be in the garden and see the touches that your father left there. Be blessed my friend. Thank you, Michael, I appreciate your sweet comment. It’s so good to hear from you! I was concerned about the absence of your posts, now I know why. I have been in your position and it is a sad but beautiful gift to share those moments with a parent. Your Dad (and your Mom) must be a special person to have raised such a wonderful human being. Sending my heartfelt thoughts to you and your family. Hi Rebecca — Welcome back! You’re a kindred spirit whose writing I enjoy and admire. You’ve been through a LOT these past months…and years. What a terrific photo of you and your dad by the lake. I can only imagine the heartbreak of losing him. I’m so glad you and your mom have each other. It’s high time for some high times! Big hug, and looking forward to more Gossip in the Garden. Been thinking of you a lot and wondering how you are doing? I had feared the worse as not heard from you in a long time. Sorry about your Dad but sure your Mother is very grateful you had listen to a quite voice in your head to sell your home as she was going to need your help. God Bless you and your family and Sending you Love also. That little voice was screaming in my head, Frieda, and I’m so, so glad I listened! I moved up here just in the nick of time. Thank you for such a kind comment – I appreciate it. I’m holding you and your family in my heart. Take good care. Thank you, Patty, I appreciate it. God bless you and your family. Sending you love. Thank you, Carol, I appreciate it. And I hope your garden is in full bloom now that summer is here!